There's always something classic and something new in the Hawaiian Islands to attract first-time and veteran visitors alike. 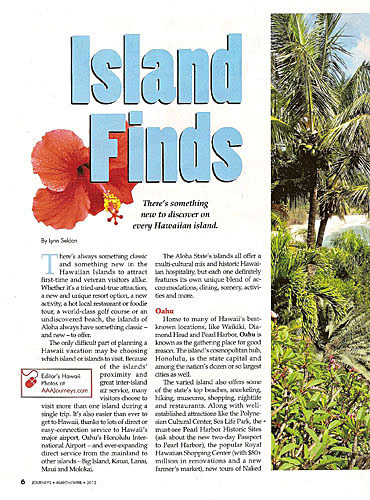 Whether it's a tried-and-true attraction, a new and unique resort option, a new activity, a hot local restaurant or foodie tour, a world-class golf course, or an undiscovered beach, the Islands of Aloha always have something classic-and new-to offer. The only difficult part of planning a Hawaii vacation may be choosing which island or islands to visit. Because of the islands' proximity and great inter-island air service, many visitors choose to visit more than one during a single trip. It's also easier than ever to get to Hawaii, thanks to lots of direct or easy-connection service to Hawaii's major airport, Oahu's Honolulu International Airport--and ever-expanding direct service from the mainland to other islands--Big Island, Kauai, Lanai, Maui and Molokai. The Aloha State's islands all offer a multi-cultural mix and historic Hawaiian hospitality, but each one definitely features its own unique blend of accommodations, dining, scenery, activities, and more. Home to many of Hawaii's best-known locations, like Waikiki, Diamond Head, and Pearl Harbor, Oahu is known as the gathering place for good reason. The island's cosmopolitan hub, Honolulu, is the state capital and among the nation's dozen or so largest cities as well. The varied island also offers some of the state's top beaches, snorkeling, hiking, museums, shopping, nightlife, and restaurants. Along with well-established attractions like the Polynesian Cultural Center, Sea Life Park, the must-see Pearl Harbor Historic Sites (ask about the new two-day Passport to Pearl Harbor), the popular Royal Hawaiian Shopping Center (with $80+ million in renovations and a new farmer's market), new tours of Naked Cow Dairy, Waikiki Aquarium, whale watching and 125 miles of beautiful beaches, Oahu offers many other natural and cultural possibilities. The Waikiki Improvement Association's yearlong revitalization program has made the classic destination better than ever with landscape enhancements, widening of sidewalks and much more. Veteran visitors also may want to check out the Kahala Culinary Academy, the Hawaiian Fire Surf School (run by off-duty firefighters), the Honolulu Zoo and the $17 million Science Learning Center at the Bishop Museum. The dining and shopping scenes also continue to expand in exciting ways island-wide. In addition, the recently merged Honolulu Academy of Arts and The Contemporary Museum recently got a new name--the Honolulu Museum of Art. The first two of 10 galleries were reinstalled through the fall and two opening exhibitions highlight the work of island artists--"Hawaii Art Now" through April 22) and "Biennial of Hawaii Artists X" through July 22. With the motto of Aloha Spoken Here, Hawaii Island (aka The Big Island) is definitely bigger and better than ever when it comes to both new and Aloha-friendly classic offerings to visitors. Along with walking on old lava or watching it hiss into the sea (thanks to Kilauea, the largest active volcano in the world), other Big Island options include: renowned golf; new tropical Segway tour, canopy, and zipline tours (including ziplining at Akaka Falls); the Isaacs Art Center Museum and Galley, housed in Waimea's first public schoolhouse; visiting the snowcapped summit of Mauna Kea; scuba diving off the Kona Coast; and interesting driving tours through fields of Kona coffee or along any coastal highway. Kona's unique Donkey Mill Art Center is also well worth a visit, providing a chance to experience the arts culture that has shaped the coffee-focused community. 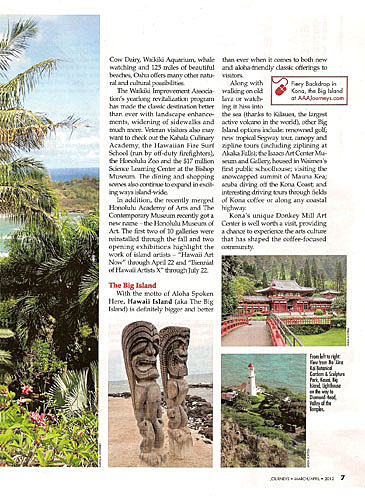 The green valleys and towering waterfalls of Kauai mean nature lovers of all sorts will love the Garden Isle. Though all of Hawaii offers incredible natural opportunities, Kauai is one of the best places in the world to enjoy Mother Nature. The cliffs and beaches of the Na Pali Coast, Waimea Canyon, panoramic helicopter rides, and more await visitors to Kauai, in addition to the newly reopened Prince Golf Course at Princeville and the new Kauai Mini Golf putting green-style layout set amidst beautiful botanical gardens. The island's eye-catching backdrop led to four major movies in 2011--including the highly-acclaimed George Clooney film, "The Descendants". The Valley Isle of Maui is a menagerie of the best of Hawaii, with world-class resorts, dining, and shopping, lots of festivals and events year-round, popular night-life (including many luaus), incredible snorkeling and diving, and great golf. Possibilities include: taking a drive along the now-classic Hana Highway (including 615+ turns and 55+ one-lane bridges); the new zipline tour at Kapalua; Tour da Food culinary tours with local food expert Bonnie Friedman; farm tours at Ono Organic Farms; and diving or snorkeling off Molokini (located 2 ½ miles off the southern coast of Maui). The extinct volcano is now designated a Marine Life Conservation District with almost 250 species of tropical fish, and is one of the top 10 dive sites in the world. The island of Molokai is certainly one of the quieter Hawaiian Islands, with the Friendly Isle featuring a leisurely getaway where there are no chain restaurants--or even stop lights. This is the place to get away from it all. Similarly, the island of Lanai (the Pineapple Island) is another unique option. These former pineapple plantations now offer great golf, tennis, and more in an upscale atmosphere that's particularly pleasing to those who want to get away from it all in refined atmosphere. There are more than 70 golf courses on the six Hawaiian Islands, ranging from award-winning resort and public layouts to municipal courses and private clubs. Ideal year-round conditions and varied landscapes have lured the likes of famous golfers to design some of the world's top courses. Whether playing one of Kauai's film location-like layouts, along the jet-black lava flows of the Big Island or the past the turquoise blue Pacific waters of Maui, golf in Hawaii remains a top draw. Hawaii is home to a wide range of accommodations to suit any interest and budget. Now Mickey Mouse and his friends are welcoming Hawaii visitors to another new Hawaii resort. Aulani, a Disney Resort & Spa, opened August, 2011. Set on a beautiful lagoon along the coast of Oahu, Aulani combines the beauty and spirit of the Hawaiian Islands with the magic of Disney accommodations, storytelling, and guest services. The new resort occupies 20+ acres of oceanfront property and is adjacent to a nine-acre blue lagoon and white sand beach. It's just 17 miles from Honolulu International Airport and less than an hour from famed Waikiki Beach.